An elk hunter recovering from a savage mauling by a grizzly bear said the bear wasn't doing anything wrong when it attacked. Broste, 36, and a friend were hunting elk the morning of Nov. 11 near Columbia Falls. He said they were moving through a brushy area about 150 yards apart when the bear appeared and attacked. It grabbed his arm and shook him, then grabbed his ankle. Broste was on his back, having fallen down following the initial rush, and was thrashing, punching, yelling and kicking during the attack. The bear finally let go of his ankle and disappeared into the brush. After the attack, Broste and his friend were able to call his wife and rescue responders. Broste was treated at Kalispell Regional Medical Center. Perhaps it's because of more awareness but it seems this year more bear attacks have been reported than in the past. Reports have come from Alaska, Montana and Wyoming this year since late summer. A hunting guide was killed by a bear but his client was able to escape. A boy was attacked while with his family in Yellowstone National Park. Hunting seasons for grizzly bears were established for Idaho, Montana and Wyoming for the first time in 40 years before a judge halted them. He ruled the bears still needed protection under federal oversight. But big game hunters pursuing elk have had encounters in the areas where bears live. After making a kill — Get the carcass out of the area as quickly as possible. Returning to the carcass — Use special precautions in returning to a carcass, including placing it where it can be easily observed from a good distance. 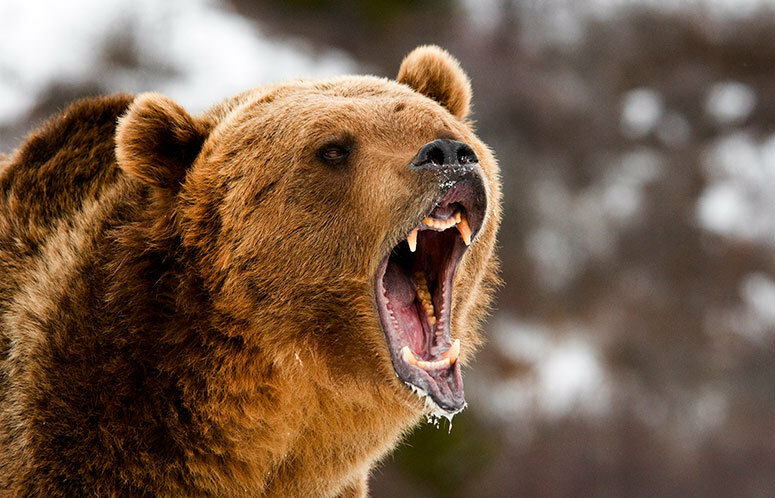 Various reports put the bite force of a grizzly at 1,200 pounds per square inch, making it one of the tops in the animal kingdom. Big cats such as lions and tigers, along with hyenas, come in at about 1,000 psi, while saltwater crocodiles are champs at 3,700 psi.